Melbourne mom Elizabeth Hunt Burrett had a lovely interaction with another parent at the Melbourne Zoo this weekend. Her new friend? A curious orangutan. 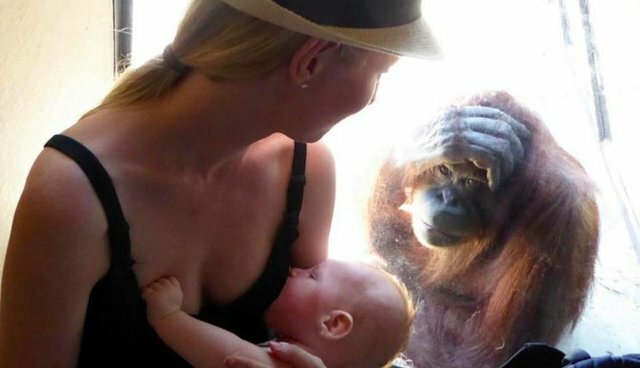 "While celebrating my daughter's 3rd birthday at the Melbourne Zoo my 13 week old got hungry while we were in the orangutan enclosure," Burrett wrote in a Facebook post. "I took him into a quiet corner away from the crowd to feed." But before long, a zoo orangutan - a mom herself, according to Burrett - had come to investigate, and she watched Burrett with quiet awe. "It was the most beautiful thing!!!" Burrett wrote. Orangutan babies stay with their mothers for up to eight years after their birth. They may nurse for up to four years - sometimes longer. Burrett also reported that no one made any unkind remarks about her breastfeeding in public. Perhaps they noticed that all moms are the same after all.